Mozart is widely recognized as one of the greatest composers in the history of music. Along with Haydn and Beethoven, he helped bring the Viennese Classical style of the 18th-century to its greatest achievement. Mozart was a genius. He was a versatile composer who wrote masterpieces in all the musical forms of his time: symphonies, string quartets, concertos for various instruments, masses, chamber music and operas. 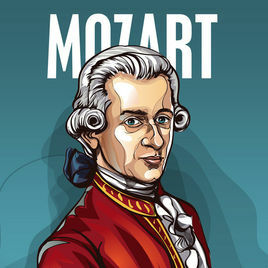 Mozart's music 'sings', and conveys ease, gracefulness, and spontaneity as well as balance, restraint, and proportion. It fuses elegance with power. Our listening example is one that is used often in today's popular culture and recognized by many. 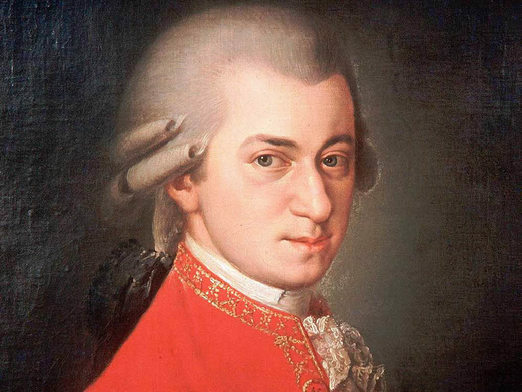 Did you know that Mozart was one of the first super-stars? 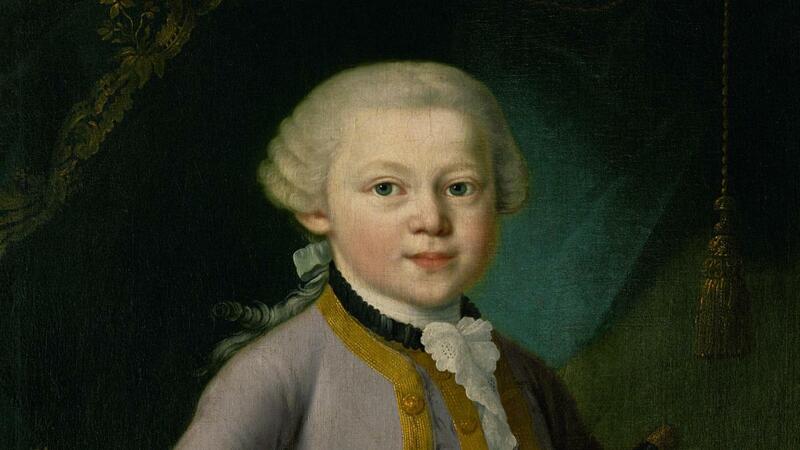 Mozart was one of the most amazing child prodigies in history. 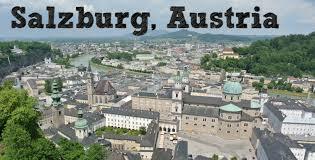 He was born in Salzburg, Austria. 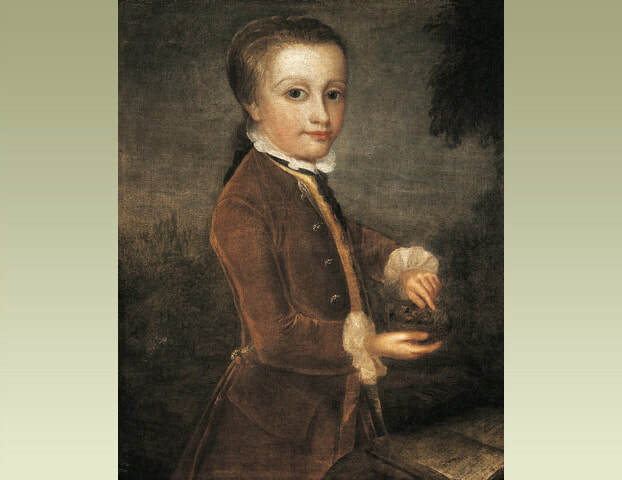 By the age of six, he could play the harpsichord and violin, improvise complex forms of music, write dances called minuets, and read music perfectly at first sight. At eight, he wrote a symphony; at eleven, an oratorio; and at age twelve, he wrote his first opera. What was happening in the rest of the world while Mozart performed for kings and queens? Here in America, our colonists were fighting the British army in the Revolutionary War to gain our independence from England and King George III. General George Washington became our first president. France also went through a revolution to gain more freedom and equality for its citizens. 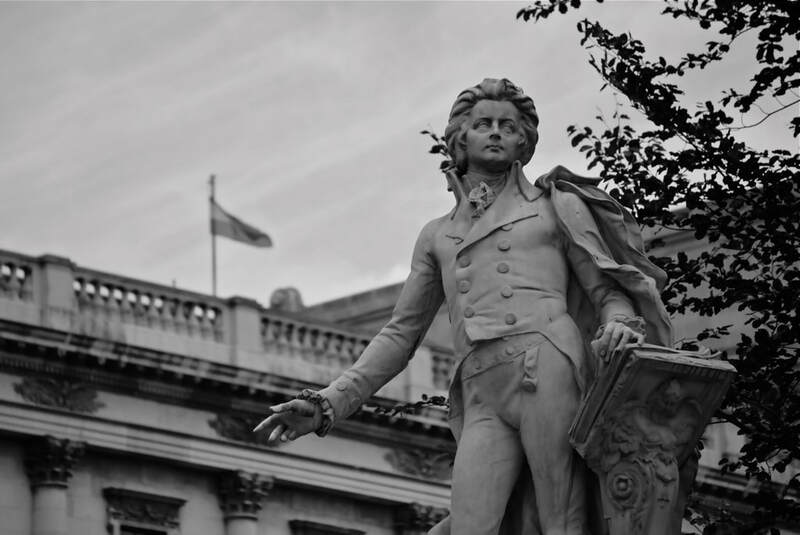 Mozart witnessed a time of great upheaval, turmoil and revolution in many European countries. Before, musicians were considered to be servants who worked in the service of someone higher up in social status, such as the nobility. By the time Mozart reached adulthood, he was discontent to be considered a servant. He believed he should be able to make his own decisions about his career and his music. Our listening example is another of Mozart's compositions that can be heard in popular culture. Symphony No. 40 in G Minor is the most passionate and dramatic of Mozart's symphonies. It is almost romantic in emotional intensity and may have influenced the music of Beethoven. The first movement conveys a feeling of controlled agitation. A pulsing accompaniment in the strings adds to the tension of the first theme. The rhythm is dominated by a three-note pattern of short-short-long. This persistent pattern gives the music a sense of urgency. A second, contrasting theme sounds calmer and more lyrical (song-like). The excitement returns at the end with furious tension. Wolfgang Amadeus Mozart helped to make classical music as popular as it was in his time, and his legacy lingers on today. 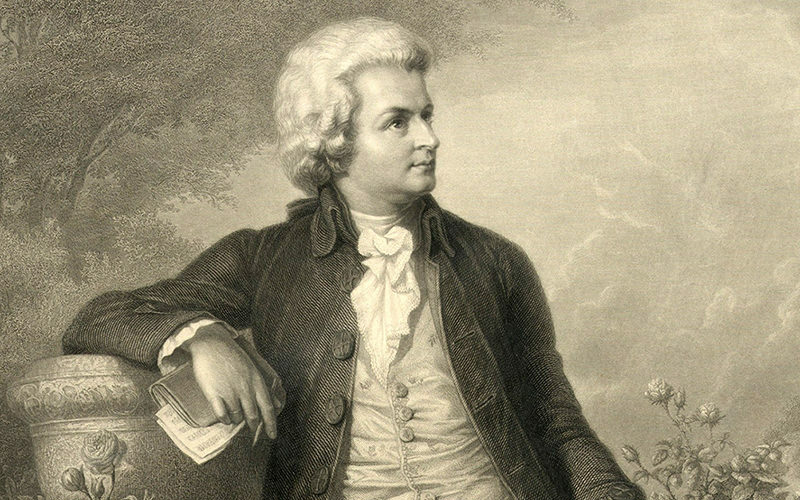 Wolfgang Amadeus Mozart was born on January 27, 1756 in a small town near Salzburg, Austria. Mozart was the only son of Leopold and Maria Pertl Mozart. He had an older sister, whom they called Nannerl. Wolfgang’s father, Leopold, was a successful musician who worked for the Salzburg court. 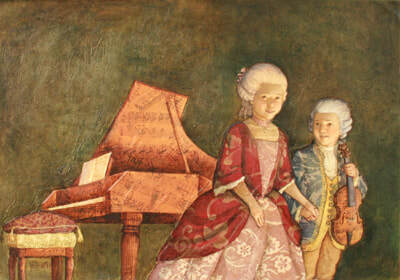 When Nannerl began her piano lessons at the age of 7, 3 year old Mozart was always right there, listening and learning. He would mimic, or copy, what she Nannerl was doing as she played the piano, and soon he was able to play piano, build cords and write music. 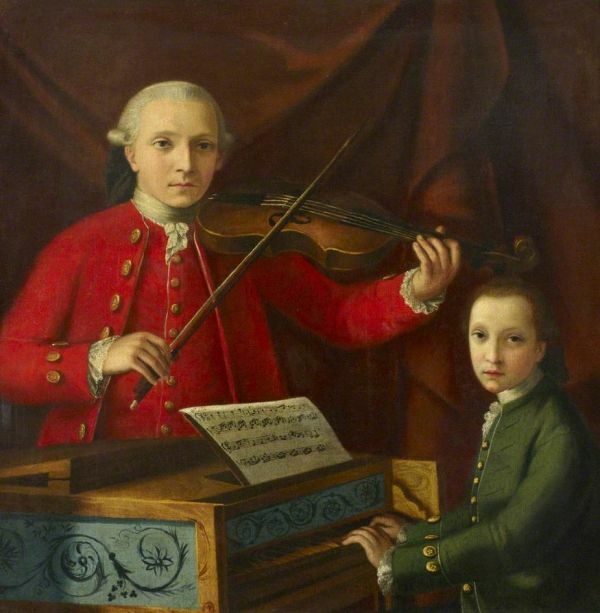 Mozart’s first music teacher was his father, Leopold. Leopold was strict and expected perfection from his children, but he was also a fun teacher who liked to find exciting ways of teaching. 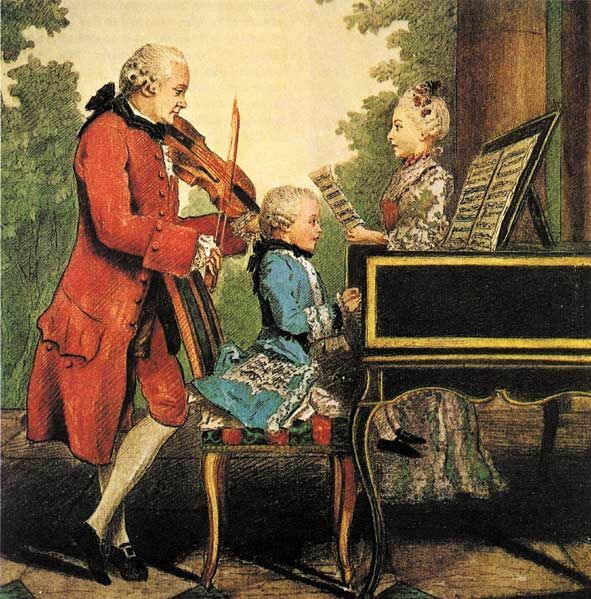 By the age of 5, Mozart had already written his first composition and was well on his way to mastering the harpsichord as well as the violin. ​Today’s Listening Example is “Eine Kleine Nachtmusik”, or “ A Little Night Music.” This is by far Mozart’s most famous composition. People often admire the song for its lively, joyful quality and its memorable melodies. The piece was completed on August 10, 1787, but wasn’t published until after he died. Wolfgang Amadeus Mozart seemed to have music in his head. He could pick up a violin and play it, without being shown how. Mozart and his sister were very good friends. They spent so much time playing together that they invented their own secret language. They would often pretend they were the King and Queen of their own village. ​In 1763, when Mozart was only 7 years old, his father, Leopold, decided it was time for his musical children to tour the world. He took both Mozart and Maria on a tour of Europe where they performed for King George III. In Austria, Mozart performed for the Emperor who called him the Little Magician. Mozart did a lot of travelling. His father took him to Italy, and there he saw opera for the first time. At the age of 12, he wrote his first opera. Today’s Listening Example is the “Papageno, Papagena” duet from “The Magic Flute” which is an opera that Mozart wrote the music, and some of the words, for later in his life. It’s a very popular opera that is still performed throughout the world today. This particular song is a duet, which means it is a song sung by 2 people; however, it also has an example of what is called recitative (rechitahteeve). A recitative is when two people, in an opera, have a musical conversation. They sing their questions and responses to each other. Try making up your own recitative on the playground today. 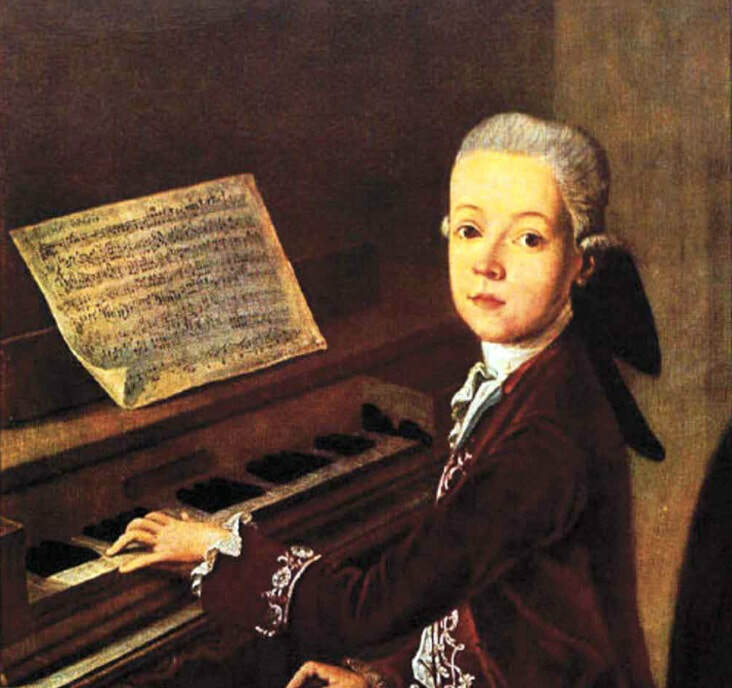 When Wolfgang Amadeus Mozart was only 13 years old, his father took him on a trip to Italy. He wanted to show off Mozart’s talents to all the important rich people in Italy. ​While they were in Italy, Mozart and his father went to a concert at the Sistine Chapel. Mozart had never heard the music before, and no one had ever allowed this music to be copied and shared outside of the Sistine Chapel. However, when Mozart got home from the performance, he sat down and wrote out the music from memory. Mozart and his father returned from Italy in 1773. Mozart was only 17 years old at the time, and he got his first job. He was the assistant concertmaster at the same place his father worked. It was in this job that Mozart was able to learn about different genres of music. He also composed 6 violin concertos while working there. In 1776, he turned his efforts toward piano concertos, which led him to write today’s Listening Example, “Piano Concerto Number 9 in E flat major”, in early 1777. Wolfgang had just turned 21. Mozart was doing pretty good for himself as the assistant concertmaster in Salzburg, but he wanted more. So, In 1777, Mozart set out to find a job that would pay him more money and give him more fame. He really liked to spend money and live like he was rich, even though he wasn’t. Mozart finally settled in Vienna, Austria. He became a teacher for the children of very rich families. He took side jobs playing at parties, balls and concerts around the city. He even found the time to get married and have 2 children. 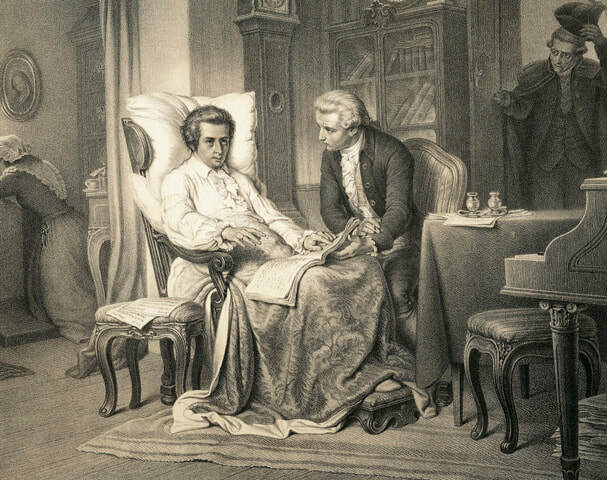 Mozart passed away when he was only 35 years old. In his very brief life, he was able to write over 600 works including: 21 stage and opera works, 15 Masses, over 50 symphonies, 25 piano concertos, 12 violin concertos, 27 concert arias, 17 piano sonatas, 26 string quartets, and many other pieces. People all over the world still love Mozart’s music. His operas are still performed in famous opera houses throughout the world. 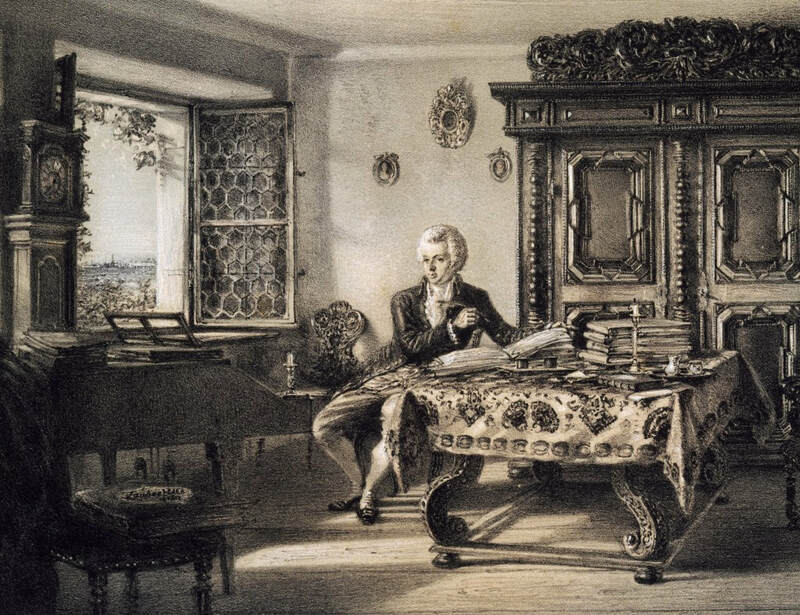 There have been many research studies that show that listening to Mozart’s music while you study can help you to remember the information you’re studying. It has also been proven to make you calmer when you listen to it. Wednesday, we saw an example of recitative, which is like a musical conversation. In today's Listening Example, we are going to see, and hear, one of the most famous opera aria’s, or song sang by one person, of all time. “The Queen of the Night” from Mozart’s opera, The Magic Flute is sung by the evil queen of the story. She is so mad that her daughter is planning to leave her kingdom that she is screaming at her. Soprano singers around the world strive to be able to sing the impossibly high notes that you are about to hear.